NOC’s Sanalla given Petroleum Economist’s “Chief Executive of the Year” award. 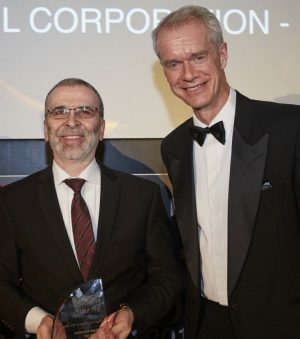 Recognition of the herculean task of keeping Libya’s hydrocarbons industry working came this week for National Oil Corporation (NOC) boss Mustafa Sanalla, who has won Petroleum Economist’s prestigious Chief Executive of the Year award. It was given yesterday in London. Sanalla won the award in recognition for his success in quadrupling oil production in the teeth of civil war. Even as militias and the remnants of the so-called Islamic State battle across the country’s vast desert spaces, engineers from NOC affiliates and partner companies have managed to fix pipes and pumps to keep the oil flowing. Production of 220,000 barrels a day (b/d) in the summer of 2016 now oscillates at around a million today. “Despite the political dysfunction and civil conflict in Libya, and frequent threats to energy installations, the National Oil Corporation has almost quadrupled its oil production since August 2016 – a feat crucial to Libya’s economic survival,” said Elliot Thomas, managing director of Petroleum Economist. Sanalla, a long-serving NOC executive, was given the chairman’s job in May 2014, just in time for the country to be plunged into crisis. Two months later, civil war broke out following parliamentary elections. With two governments fighting each other from opposite ends of the country, oil production plunged , and the pre-war figure of 1.6 million b/d is a distant memory. Keeping on some sort of terms with both warring governments is only one hurdle for Sanalla. The other has been his campaign against Libya’s militias demanding hefty payments for allowing oil facilities to operate. That fact is probably the key to Sanalla’s success. In a country with no postal service, railway or public bus service, oil has a unique status. The NOC is arguably Libya’s one working institution. “Its engineers, accountants, sales staff and geologists have worked with each other for years. They have a strong bond,” says John Hamilton, director of London consultancy Cross Border Information. But it has been a bumpy ride. In late 2014, he was sacked by the Tobruk parliament. Nevertheless, he stayed in place in the NOC HQ in Tripoli, arguing against splitting the organisation. In 2015, he signed a deal with Glencore guaranteeing sales from Tobruk port and a deal with a second Swiss-based trader, Vitol, guaranteeing petroleum imports: much of Libya’s petrol is imported, partly because refinery capacity is limited, partly because it would be financially foolish to waste too much of the high-value, sweeter Libyan crude on turning it into petrol. Not everyone was happy with the deals, least of all other foreign buyers who grumbled about loss of contracts. Supporters insisted that with tanker operators reluctant to risk their ships in Libyan ports, the Glencore and Vitol deals did at least ensure regular customers. In 2016, Sanalla persuaded both eastern and western governments that the NOC should be united under a single management, with him in charge. But this has remained a juggling act: Sanalla continues to rail against the militias, while objecting against the Beida government’s bid to sell oil independently and the Tripoli government’s attempt to take key NOC powers for itself. Sanalla’s big break came in September last year when Khalifa Haftar, chief of the Libya National Army, captured the central oil ports from the forces of Ibrahim Jedhran which had kept them closed, demanding payment. After that, oil started to flow from the Sirte Basin, home to two thirds of the country’s production. But the capture sharpened the challenge for Sanalla in remaining neutral, with many in Tripoli furious about the LNA’s capture. The international community, with a spotty record on Libya, can at least congratulate itself on its consistent demand, enshrined in a UN Security Council statement, that the NOC remain independent of Libya’s fragmented governments and administrations. Sanalla has drawn plaudits for being open about his objectives, in a country not known for its transparency. In November 2015 he published an oil plan, setting out how much oil, and revenue, Libya could expect depending on stages of his production recovery plan. “The secret of Sanalla’s success is that he is very transparent about what he intended to do, and then goes about doing it,” said Geoff Porter, head of US-based North Africa Risk Consulting. But the NOC’s problems remain. Sanalla has abandoned his target of getting production to 1.25 million b/d by the end of the year, frustrated by fighting and disputes which continue to see western fields taken offline, including Sharara, the country’s biggest, and most recently Wintershall’s Sara field, closed by locals demanding greater investment in the area. Yet reaching the million-barrels-a-day target remains a significant achievement, and a potential lifeline. With the economy shattered by war, oil and gas are Libya’s only exports, and the only source of cash that most of the population depends on to survive, other than fast-depleting foreign reserves. The oil production recovery, incomplete and erratic, has at least given Libya some financial breathing space. The Petroleum Economist awards are aimed at celebrating individuals, companies and projects which stand out as the best in the energy industry. Other winners of the Petroleum Economist’s award this year are Total, named Large Cap Energy Company of the Year, and ENI which won the Exploration Company of the year. The Minster of the Year award went to Saudi Arabia’s Khaled Al-Falih.